Who says a salad has to have a ton of ingredients? 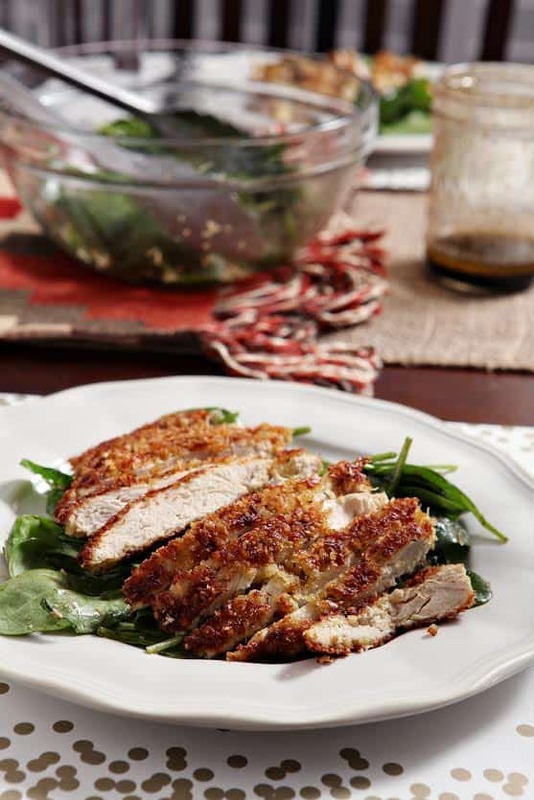 Simple and delicious, this Crunchy Parmesan Chicken Salad makes for a great, satisfying meal. Hey, friends! As you read this, Mr. Crumby and I have set off on our belated honeymoon to Europe, and to keep you company while we’re away, I’ve asked five of my closest blogging friends to guest post, and to share with you their favorite European-themed recipes. Today, we are saying “arrivederce” to Florence and Tuscany and all things Renaissance and wine and gorgeous for the final stop on our trip: Rome! We have a few more days of eating, drinking, and being merry ahead of us, but I’m already thinking about cleaning up our eating habits when we return to the States and our normal lives, and my darling Texan soulmate, Erin from The Speckled Palate, has a great Italian-inspired recipe that’s perfect to start us off right, but still keep us in vacation mode: Crunchy Parmesan Chicken Salad. Without further ado, meet Erin!! Hi, y’all! I’m Erin, and I blog over at The Speckled Palate. I’m super excited that Erica has handed the reins of The Crumby Cupcake over to me while she’s gallivanting all over Europe… and I’ve got a fun recipe for y’all today. When Erica first reached out to me about posting for her today, and I learned where she and Mr. Crumby were traveling, I knew I wanted to make an Italian dish. But as the deadline drew nearer, I had a hard time finalizing what I was going to make. I spent a summer studying art in Italy during college. I adored my time there, but I didn’t cook at all that entire summer… and nobody taught me how to make any authentic Italian dishes while I was there. Anyway, I was too busy scarfing down everything that was placed on my plate to even think about cooking for myself. That being said, I wanted to make y’all an authentic recipe… but I have no authentic Italian recipes. So we’re doing a rendition on a favorite dish of mine that’s semi-Italian, and it’s something I craved while I was studying abroad. My little town, Cortona, is nestled atop a hill in Tuscany. It’s relatively small, though the movie and book Under the Tuscan Sun are based in it, and it’s insanely gorgeous. Italians are all about local seasonal cuisine, and every night, we ate family style meals at a local restaurant. We didn’t choose what we ate — staff just brought out multiple courses and served us without saying what we were eating. Some people didn’t like this, but me? I adored the adventure, and I would eat seconds (and sometimes thirds or fourths) on the pasta dish before moving on to our entree since the next course was always unknown. We were served a lot of beef and pork during my time in Italy, and my friends and I found ourselves craving chicken. In fact, only one restaurant in town served a chicken dish, and we flocked there for a classmate’s birthday, all ordering the dish and feeling slightly disappointed once all was said and done. Chicken: It wasn’t abundant in Tuscany during my summer there, and since it’s my go-to protein, I missed it. So in celebration of Erica and Mr. Crumby’s travels, I’m sharing a little dish that is Italian inspired and that calls for my go-to protein. 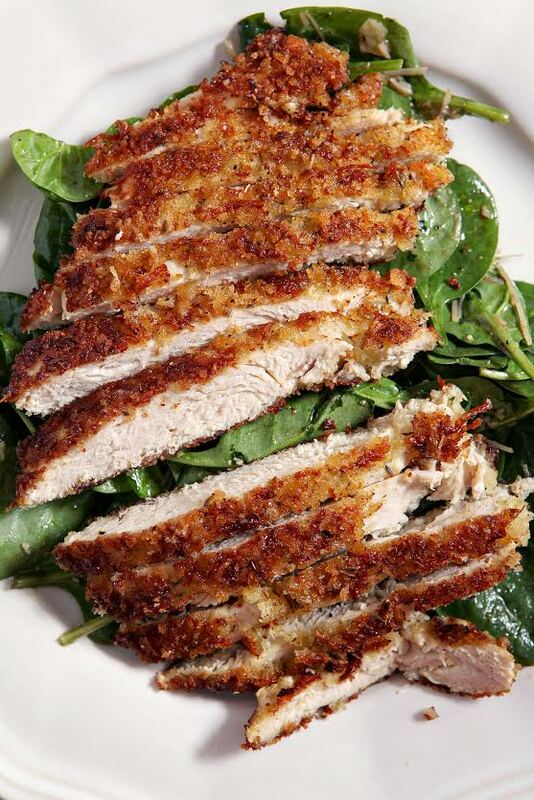 This Crunchy Parmesan Chicken Salad is so incredibly simple to pull together on a weeknight. My husband and I whipped it up in no time a few nights ago, and it’s incredibly satisfying. 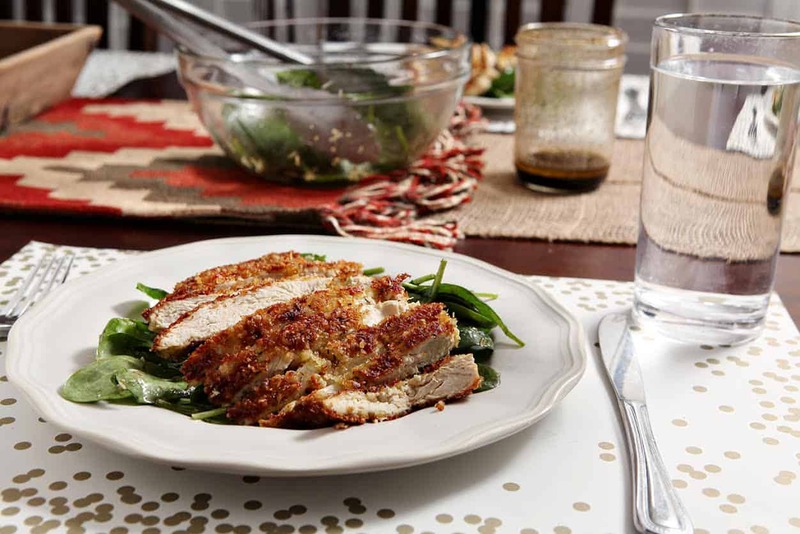 The chicken is pounded and flattened, then coated in an egg wash, tossed in a panko mixture and thrown in a frying pan with a minimal amount of oil to brown both sides. 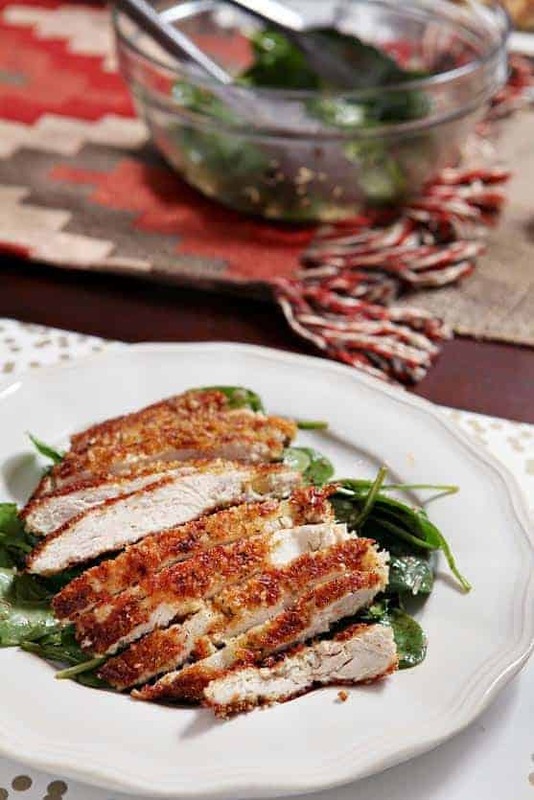 While it’s cooking, you mix up a little homemade balsamic vinaigrette, toss that on some fresh spinach, then when the chicken has cooked through, chop it into slices and serve it atop the salad. Super easy. Super delicious. Maybe it’s not really Italian, but it’s darn good. In a nonstick skillet over medium-high heat, add the olive oil. Set out the ingredients in different bowls: The beaten egg should be in one. The panko bread crumbs should be in another relatively large one, tossed with the seasonings. Prepare the chicken: Once the chicken has been pounded and tenderized, toss it into the bowl with the beaten egg. Make sure it’s coated, then transfer it to the bowl with the panko. Once the chicken is coated on both sides, carefully transfer into the skillet. Repeat this process with the second chicken breast. Cook each chicken breast for about 10 minutes on the first side. Turn when the chicken’s coating is a golden brown color. Cook on the other side until cooked through, then remove from the heat. While hot, cut into strips. Prepare the salad dressing: In a mason jar, combine the olive oil, balsamic vinegar, honey, freshly ground black pepper and salt. Place the cap on the mason jar, and shake until mixed. 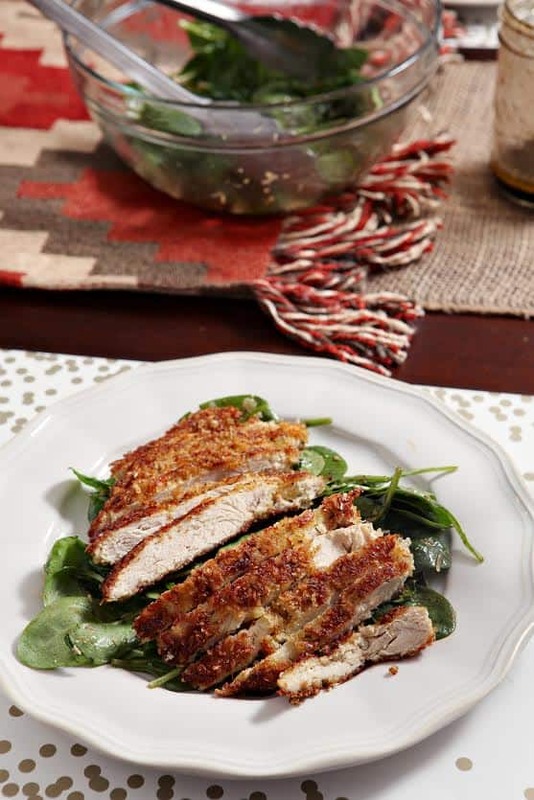 Place the spinach mixture on plates, and transfer the warm chicken strips on top of the salad greens. Enjoy warm! Do you have a go-to European-inspired recipe? Share it! You’re speakin’ to my heart!